By now, avast! users are aware of the importance of creating strong computer passwords, and guarding their Social Security number like a trained Doberman. 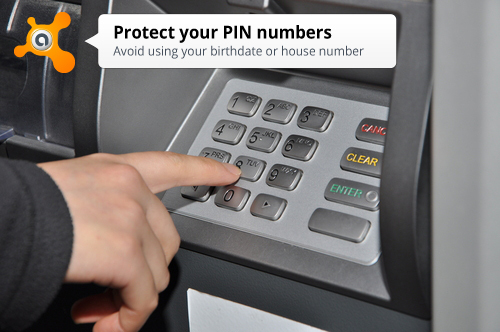 But what about the humble four-digit personal identification number (PIN)? PINs are security features just like passwords. They give access to your mobile phone, credit card, bank account, and numerous other things. My garage door opener even has a keypad and PIN. Because it's the key that unlocks so many doors, literally and figuratively, it pays to keep your PINs safe. Be more original than 1234. One in 10 people use this number combination. Together with 1111 and 0000, these three combinations make up nearly 20% of PINs. Think of it this way, if you find an ATM card on the floor, you have a 1 in 10 chance of getting the correct number if you type 1-2-3-4 . Using your birthdate as a PIN is a bad idea. Everyone carries their driver’s license in their wallet with their ATM card. The birthday information gives a wallet thief both the lock and key in a convenient location. One study said that one out of 15 wallet thief victim’s also had their ATM raided! Forget about your address too. Your house or apartment number is also printed on your driver’s license, so it’s easily found. Use the bank assigned number. Just don’t write it on your ATM card. An old phone number, student or work ID is good, as long as they’re not listed anywhere. Choose a meaningful number. The score of the big game (your favorite basketball team won 80-58, so the PIN is 8058). Base the number on a phrase instead of a word, such as 2432 for “Avast is FREEking awesome” (AIFA). Hide the number in a fake contact. If you have too many PINs to remember, make up a fake contact with a fake phone number and keep it in your phone. Just don’t let the battery run out! Share your tips in for creating strong PINs and how to remember them in the comments section. And please follow us on social media. We can be found on Facebook, Google+ and Twitter.